Plants and trees which draw sap from the earth, water from the cloud, energy from the wind and sun not only survive for themselves, but they are proving to be of great use to all beings. As long as they live, they serve the society by yielding fruits, flowers, medicinal leaves and bark. Trees supply pure oxygen and offer cool shade. They draw clouds and cause them to rain. They are holding the earth stronger with their roots. So long as they survive, they not only give cool shade to the birds, fodder to the cattle and turn into fuel-wood useful to man.Baba wants us to emulate trees which can set before us ideals and serve as our guides. Thus, He brought several plants from every nook and corner and planted them in the Lendi Garden. He Himself watered the plants everyday. Every act of Baba has a meaning for it and it is a lesson in the art of living for us. We enjoy the fruits of trees that were planted by our ancestors. Likewise, we have to take pains and raise beautiful gardens and orchards for the posterity. If a plant is protected when it is a sapling, it will protect us, in turn, when it grows into a big tree. 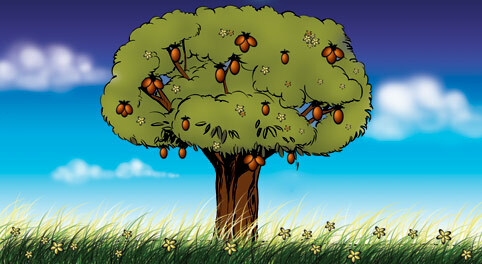 Trees do not store fruits for themselves. The message they drive home is that even man should not hoard all his earnings. We have to look to trees as our teachers and take them as a model and make use of our earnings for the social upliftment and good.